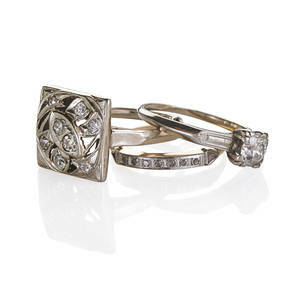 THREE DIAMOND 14K GOLD RINGS; OEC diamond engagement ring, approx. .65 ct., square set in wg. with yg. rose cut diamond band; OEC diamonds in square open work wg. ring, approx. .40 ct. Ca. 1940. Sizes 8 - 8 1/2. 4.8 dwt.